It’s Premiere day !!! Happy Ugadi 2019 to all the patrons. 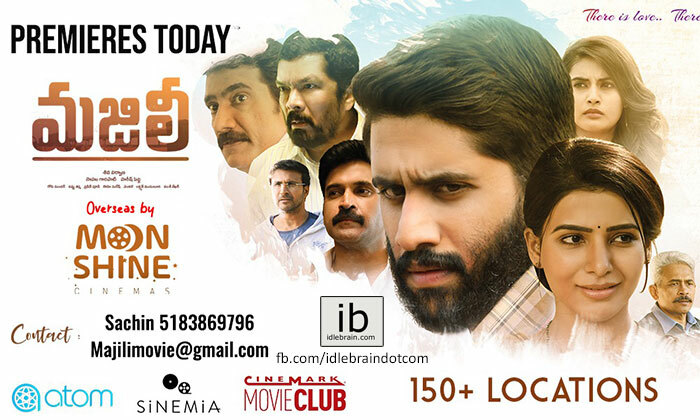 Yuva Samrat Naga Chaitanya and Samantha's Majili is all set for Grand Premieres today. Tickets for the Premieres are priced at $12 for Adults and $9 for Kids. The movie is releasing in more than 150 locations & Tickets in all the major locations are fast-filling. Book your tickets and enjoy this intense romantic drama this Summer. Moonshine Cinemas thanks all the audience for their continuous patronage and all our exhibitors for investing their trust in us. We also appreciate Theater Chains for accommodating us the best Possible Release. Moonshine cinemas is very thankful to media for all their co-operation in releasing our Press Communications and Schedules.